Thousands of people on Saturday turned out to demonstrate against a recent ruling by Mexico's highest court that effectively allows gay and lesbian couples to marry. The ruling, handed down last month, declares state bans unconstitutional but falls short of striking them down. However, district judges are now obligated to grant injunctions to gay couples who are denied a marriage license. 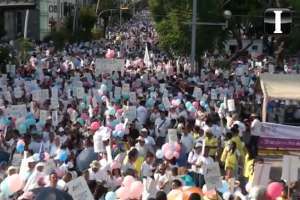 The march was organized by the 230-member coalition “Jalisco is one for the children” and endorsed by Cardinal Francisco Robles Ortega, the Roman Catholic archbishop of Guadalajara. “The intention is to celebrate four things: yes to marriage between man and woman, the right of children to have mom and dad, the right of parents to educate their children and yes to life from birth to natural death,” Luis Antonio Martinez, a member of the organizing committee, told EFE. Brenda Del Rio, a volunteer, condemned the court's decision. The march was capped off by a mariachi concert.